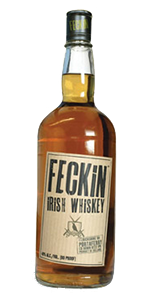 March 27, 2015 – Admit it, you’ve probably seen a bottle of Feckin Irish Whiskey on the shelf and snickered a bit…probably considered it a novelty and moved on. Turns out there really was a St. Feckin in Ireland, and even though he was a teetotaler, his name lives on in the whiskey Shane Braniff created in 2005. Braniff blends his whiskey from stocks distilled at Cooley Distillery, and while Feckin has achieved cult whiskey status, he’ll admit that there are places where his whiskey will never be sold because of the name. In 2013, Braniff and his family opened Northern Ireland’s first new distillery in 125 years. The Echlinville Distillery’s spirit won’t be ready until at least August of 2016, but in addition to Feckin and its spiced variation, Braniff has also worked to revive one of Irish Whiskey’s legendary brands. Dunville’s hasn’t been produced since 1936, when the Belfast Distillery closed. The first release of Dunville’s is expected soon – an Irish malt whiskey finished in Pedro Ximenez sherry casks.